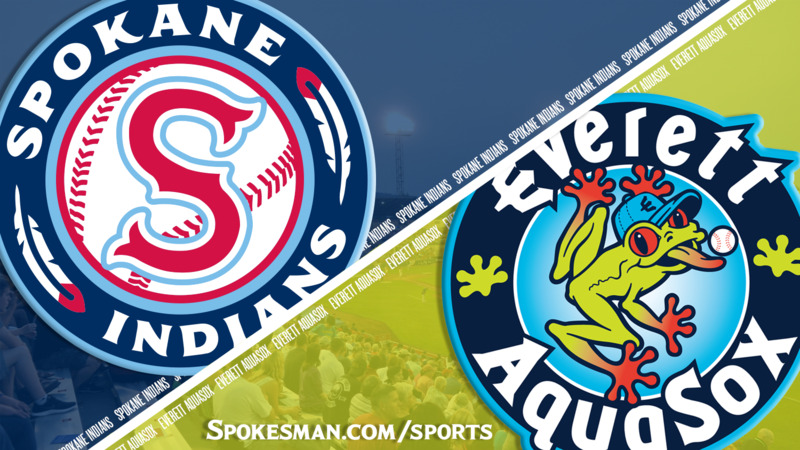 EVERETT – Francisco Ventura ripped a go-ahead two-run double in the eighth inning to help the Spokane Indians down the Everett AquaSox 7-3 in the finale of a three-game Northwest League series at Everett Memorial Stadium on Wednesday. The Indians (14-19) narrowed their deficit in the North Division to three games behind Everett (17-16) with five games to play in the first half. With one out in the eighth, Spokane’s Cristian Inoa was hit by a pitch and went to third on a single by Tanner Gardner. Ventura lined a double to left to plate both runners and give the Indians a 4-3 lead. Austin O’Banion lashed a double down the right-field line to score Ventura for an insurance run. The Indians picked up two more runs in the ninth. Indians starter Tai Tiedemann went 5 1/3 innings and allowed two runs on six hits and two walks with three strikeouts and two hit batters. J.P. Martinez got the Indians off to a good start, ripping the second pitch of the game over the wall in right-center for his fourth home run of the season. In the bottom of the first, the AquaSox loaded the bases with no outs. With one down, Tiedemann fielded a tapper and fed Ventura for a forceout at home. Geoandry Montilla bounced out to end the threat. Tiedemann retired the next seven batters but ran into trouble in the fourth. He hit a batter and issued a walk. With two down, Jansiel Rivera’s ground ball got through to plate the tying run. The AquaSox started the fifth with back-to-back singles to put runners on the corners. Connor Kopach bounced to third and Inoa cut down Connor Hoover at the plate. Cal Raleigh delivered an RBI single to make it 2-1. A botched suicide squeeze caused the second out at home plate in the inning. Tiedemann coaxed a ground ball to finally end the threat. Tiedemann retired the first batter of the sixth, but after issuing his second free pass was lifted in favor of reliever Wes Robertson (1-0). Robertson walked his first batter but struck out the next two to escape damage. The Indians loaded the bases in the seventh on a single, hit batter and walk. No. 9 hitter Hasuan Viera battled back from 0-2 and watched a full-count fastball drift outside to force in a run and tie the game at 2. With one out in the bottom of the seventh, Ryne Ogren doubled and scored on a line-drive single by Raleigh, the Seattle Mariners’ third-round pick out of Florida State making his professional debut. In the ninth, Martinez tripled with one down and came in on a single by Tyler Depreta-Johnson. On the next pitch, Inoa lined a double to the gap in left-center and Depreta-Johnson scored from first. Kyle Keith struck out three over two scoreless innings to earn his first save. Bench coach Carlos Maldonado handled managerial duties as manager Kenny Holmberg missed his second game with his expecting wife for the birth of his first child and her second. Published: July 18, 2018, 2:24 p.m. Updated: July 18, 2018, 3:41 p.m.